Lacks the polish and panache to be a true champion, but Viking is still solid, no-thrills entertainment. After four years aboard a longship from console land, Creative Assembly's hack and slasher (and chopper and slicer) about Norse mythology and decapitation has finally landed on the PC's shores. In Viking: Battle for Asgard you play Skarin, who must liberate Midgard from the invading forces of Hel, Queen of the Underworld, in his role as champion of Freya, Goddess of Plot Advancement. Hel's forces have captured three key islands, and your job is to travel across each one, dispatching her minions and freeing the soldiers they've imprisoned. The combat is solid, if never spectacular: a collection of light and heavy attack combos, blocks, dodges and mana-bar-draining elemental weapon power-ups. But the repetition, of both the moment-to-moment fighting and the campaign structure, anaesthetises you from ever feeling truly excited about the on-screen action. Skarin is constantly chopping off limbs in slow-mo finishing flourishes, to a point that feels gratuitous. You'll see the same animations so many times against the handful of enemy types that it quickly becomes boring. There's a running theme of Viking paying lip-service to presentation, only for it to fall flat. The Nordic wrapping, for example, promises an entertaining world, but the unengaged voice acting quickly nixes any investment. This leaves nothing to mask the dearth of substance. Viking is a game you play on autopilot. The slow tick towards completion, seeing red map icons turn blue and watching the colour saturate back into liberated areas, is compelling, but moments of genuine spectacle are rare. The occasional stealth infiltration missions are jarringly terrible. As with all attempts to force stealth into an engine unsuited for it, it's never entirely clear when enemies can see you. Being discovered causes a flood of enemies to charge, leading to a quick death and a frustrating respawn outside the base. The other stand-out segment is far more impressive. Complete enough objectives on whichever island you're working through, and you're prompted to start an assault, leading an army of Vikings against the monsters. Now you're scrapping in the midst of two warring armies, defeating champions and ordering dragons to attack strategic targets. They're fun, look terrific, but only come after hours of mission churn. Everything Viking does (stealth aside) is competently put together, but it lacks the flair and fluidity you want from a truly great hack-and-slash game. 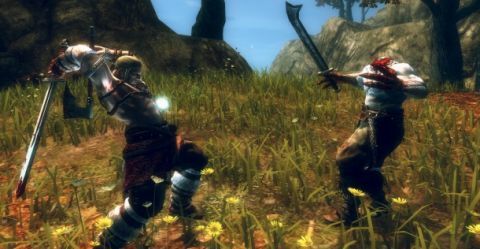 The same can be said of Hardlight's porting, which is smooth and reliable, but comes burdened with awkward keyboard controls and a capped framerate. Fortunately, Viking also comes to us with a four-year-old price tag. That means it's is undeniably good value, even if the thrills are sparse.